Apple is said to be working on a smaller iPad with a 7.85″ display, according to a new report from Digitimes. Citing sources in the supply chain, the “iPad Mini” is suggested to debut late in 2012, not alongside the expected iPad 3 release earlier in the year. Getting more specific, the display panels for the device are said to be supplied by LG and AU Optronics, and that production will begin at the end of the second quarter of next year. This isn’t the first time a report of an iPad with a smaller 7.85-inch display has surfaced. 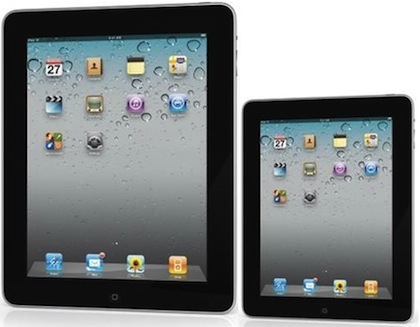 Last month, an analyst report also suggested that a smaller iPad would be released sometime in 2012, in addition to the iPad 3 with a retina display. It’s the iPhone family of products approach going to the iPad line, it’s bound to happen. Where would a 7″ fit into this? At $299? That is an unlikely price point, too close to the iPod touch. At $399 it would be still 2x the cost of Kindle Fire, and would match the price of the hypothetical new iPad 2 base model, so that is equally unlikely. Apple isn’t going to race the tablet market to the bottom on price. Amazon is losing money on each Kindle sale, hoping to make it up on purchases, but that isn’t the profit model of Apple. Thus, a $199 iPad 7″ is never going to happen, and a $299 model is unlikely to be possible given the iPod touch. And why offer something at that price point when ultimately the device they want to sell is $399? I agree with Benizia. I’d believe a 4 inch iPhone/iPod Touch over 7 inch iPad. It doesn’t fit anywhere in Apple’s price structure, it really is just a tad too small for vertical portrait reading (held horizontal landscape you can get a good view, but you have to scroll up and down in a two column layout. It just doesn’t feel like a good size. iPod Touch Maxi or iPad Mini? I just don’t see it. Why carry around another device that’s only slightly larger than the iPhone you (presumably) already have? It would have to have a retina display to make it worthwhile, and at that point, you’re probably looking at $500. I think Apple is trying to replace the Amazon Kindle Fire by making this mini iPad, so it should cost around the same as the Fire.